Babies: How They Rule & Drool! Newborns are amazing high-maintenance miracles. Though the first few weeks consist mainly of eating, sleeping, crying and dirty diapers, there is a LOT going on in those little bundles of joy. Babies develop faster than at any other stage, and their brains form neurological connections at an astonishing rate. Just imagine how crazy the experience must be: you have no sense of time or self, live happily suspended in a temperature-controlled environment, and then one day the space is noticeably too small. Before you know it you’re getting pushed out, and are welcomed head-on into the intense world of sensory experience. At the moment of birth, sight, sound, smell, taste and touch are fully activated and our brains are flooded with a near-constant stream of information. We’ve each been through it ourselves, although this far along in our journeys we take this sort of thing for granted. Over the years we’ve learned how to filter our intake of sensory information, whereas infants are taking it all in. 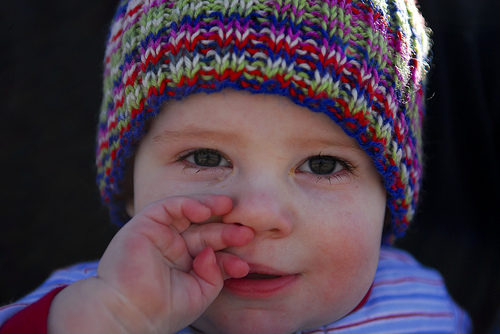 Infants have fuzzy eyesight at first, and can only see about 8″-12″ from their face clearly. This allows them to see the face of whomever is holding them. They can see beyond one foot, but it’s blurry – they see light, shadow, motion and high-contrast colors. Besides looking at human faces, bright colors, high-contrast patterns and movement are what capture a baby’s attention most. Visual clarity and depth-perception approach adult levels by around 8 months. While still in the womb, infants hear things like their mother’s heartbeat and voice, music, and the voices of others near the mother. Once on the outside, loud sounds will startle babies easily. What’s their absolute favorite music? Hands-down, the voices of their parents. All the more reason to sing, talk lovingly, hum or make funny sounds – it’s soothing, interesting and neurologically stimulating. As with all humans, taste and smell are very closely related. Babies prefer slightly sweet flavors, and will turn away from smells they don’t like. Breast milk is delicious to infants, and is filled with the mother’s antibodies. This fortifies an infant’s immune system in ways that nothing else can. Babies crave touch! Being held and stroked by parents (as opposed to poked or tickled) will increase eye contact, smiles and vocalization. This doesn’t make tickling off-limits, it just depends on the baby. If they’re smiling, vocalizing and making eye contact, it’s a kind of touch they are comfortable with. Touch is a major way for babies to explore the world. Providing safe, colorful toys with different shapes and textures is a wonderful way to nurture their development. To learn more about infant development, click here to sign up for the Growing With Your Child newsletter and receive a FREE Overview of Child Development eBook today!